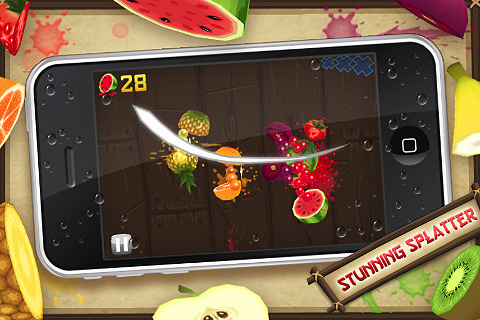 Half Brick Studios just released a simple but challenging casual game called Fruit Ninja. The game is a simple affair that has you swiping at the screen to dismember pieces of fruit that are lobbed in your general direction. It’s a bit of a shooting-gallery type experience but one you are swiping to slice rather than tapping to shoot. You’re only allowed to miss 3 pieces of fruit before it’s game over — but beware, slicing a single bomb (thrown up randomly) will result in an instant game over. Gameplay footage starts about 30 seconds into the video. It’s simple, fun and best of all challenging. 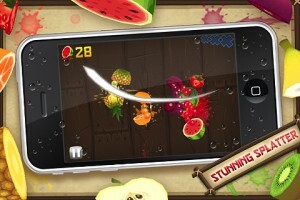 Fruit Ninja also contains Open Feint for global high scores and achievements.